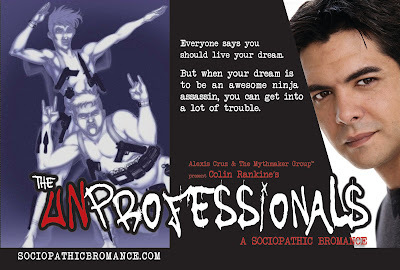 Folks who made it to the East Coast for New York Comic Con to see The Unprofessionals creators, Alexis Cruz and Colin Rankine, got a little something something in the Limited Edition Trade Paperback. Not only is this special edition signed and numbered by Alexis, but the purchase included a code for a FREE digital download of the upcoming Chapter 2! And...we still have copies! 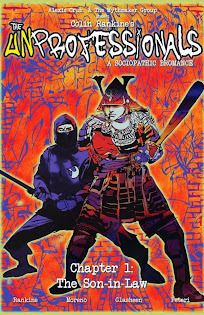 Leo and his brother-from-another-mother Jake are a pair of homicidal nerds who dream of being awesome ninja assassins, and they've already got one job under their belt: low-life gambler and Welfare cheat Benny Chow. But they've stepped on the toes of Bojack & Lugo, two vicious pros with sensitive egos, and their shenanigans have drawn the attention of the NYPD. The Unprofessionals--A Sociopathic Bromance, Chapter 2: Spider-Man, written by Colin Rankine, with art by Kate Glasheen, and lettered by the amazing Troy Peteri, has a hard-target release date of November 5! Couldn't make it? We *might* have a little something for you... Pre-order The Unprofessionals, Chapter 2 in our online store. **OR** Pick up one of the last remaining copies of The Unprofessionals, Chapter 1 limited edition trade paperback, and get a code to download the comic, FREE! These are convention specials and are a limited run. Get them now before they're gone forever!